The Syncom satellites were 71 cm diameter, 39 cm high cylinders. The fully fueled mass of the spacecraft was 68 kg. The nozzle of the solid propellant apogee motor (1000-lb-thrust designed to impart a velocity increase of 1431 meters/sec) extended from the bottom of the cylinder and a co-axial slotted array communications antenna from the top. The total height including the nozzle was 64 cm. The radial exterior was covered with 3840 P-on-n silicon solar cells which provided direct power of 29 Watts the 99 percent of the time the spacecraft was in sunlight. Nickle-cadmium rechargeable batteries provided power when the spacecraft was in the Earth's shadow. No active thermal control was required. Most of the central interior of the spacecraft consisted of the tanks and combustion chamber for the apogee motor, around this were arranged two hydrogen peroxide and two nitrogen tanks and the electronics. Attitude and velocity control was provided by nitrogen jets to align the spin axis and hydrogen peroxide jets to position the satellite. Each system had two jets, one parallel and one perpendicular to the spin axis. Syncom employed a redundant, frequency-translation, active repeater communication system designed to handle one two-way telephone or 16 one-way teletype channels. The dual transponders utilized 2 watt traveling wave tubes. Selection of receiver and transmitter was made by ground command. One receiver had a 13 megacycle bandwidth for TV transmission, the other a 5 megacycle bandwidth. The receiving gain was 2 dB through the slotted dipole antenna. Signals were received on two frequencies near 7360 megacycles and retransmitted on 1815 megacycles. The slotted dipole transmitting antenna radiated a pancake-shaped beam 25 degrees wide with its plane perpendicular to the spacecraft spin axis. There were also four whip antennas oriented normal to the spin axis for telemetry and command. Syncom 1 was designed to be the first test of a communications satellite in geosynchronous orbit. The objective of the mission was to put the satellite into a 24 hour orbit with an inclination of about 30 degrees over the Atlantic Ocean. After launch into a highly elliptical orbit on 14 February 1963, initial communication tests conducted from the USNS Kingsport off Nigeria were successful. About 5 hours after launch the apogee motor was commanded to fire to place the satellite into a near-synchronous orbit. At about the time the motor completed its 20 second burn all contact was lost. NASA officials assumed that "the satellite's spin axis was misaligned at the time of the apogee motor firing. Because of this they have been unable to determine whether the satellite is damaged." Attempts were made to communicate with the spacecraft but contact was never re-established. Using search patterns based on data from the Kingsport's range and range rate system, the Boyden Observatory at Bloemfontein, South Africa, sighted Syncom 1 on March 1. The spacecraft's initial orbit was computed to be 34,186 km to 37,021 km with a period of 23 hours, 46.5 minutes. Syncom 2 was the first geosynchronous satellite. Although the period was 24 hours and the spacecraft remained at a nearly constant longitude, the orbit was inclined at 33 degrees so it was not truly geostationary but moved in an elongated figure eight pattern 33 degrees north and south of the equator. Syncom 2 was an experimental communications satellite placed over the Atlantic Ocean and Brazil at 55 degrees longitude. It began regular service on August 16th. It demonstrated the feasibility of geosynchronous satellite communications. Voice, teletype, facsimile, and data transmission tests were successfully conducted between the Lakehurst, New Jersey ground station and the USNS Kingsport while the ship was at sea off the coast of Africa and television transmissions were relayed from Lakehurst to the telstar ground station at Andover, Maine. The Syncoms were the forerunners of the Intelsat series of satellites. Syncom 2 was launched into a high altitude orbit from Cape Canaveral on 26 July 1963. Six hours after launch the apogee motor was fired to place the spacecraft in an orbit ranging from 34,100 to 36,440 km with a drift rate of 7.5 degrees per day eastward. The apogee was then raised and the drift rate changed to 4.5 degrees per day westward toward the desired position over 55 degrees longitude. After two weeks of drifting the nitrogen jets were pulsed in a series of four firings to slow the spacecraft to near-zero drift on August 16, followed by an alignment maneuver. The final orbit was geosynchronous with an inclination of 33 degrees. Operations were turned over to the Department of Defense on 1 January 1965. 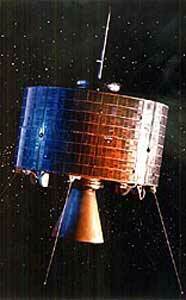 Syncom 3 was the first geostationary satellite. (The earlier geosynchronous Syncom 2 had an orbit inclined to the equator.) It was an experimental geosynchronous communications satellite placed over the equator at 180 degrees longitude in the Pacific Ocean. The satellite provided live television coverage of the 1964 Olympic games in Tokyo, Japan and conducted various communications tests. Operations were turned over to the Department of Defense on 1 January 1965, Syncom 3 was to prove useful in the DoD's Vietnam communications. Syncom 3 was launched from Cape Kennedy on 16 August 1964 and injected into an elliptical orbit inclined 16 degrees to the equator following a third stage yaw maneuver. The apogee motor was fired to remove most of the remaining inclination and to provide a circular near-synchronous orbit of 35,670 km × 35,908 km. The spacecraft next carried out a series of attitude and velocity maneuvers to align itself with the equator at an inclination of 0.1 degrees and to slow its speed so it drifted west to the planned location at 180 degrees longitude where its speed at altitude was synchronized with the Earth. These maneuvers were completed by 23 September, and Syncom 3 was used in a variety of communications tests, including the transmission of the Olympics, transmissions between the Philippines, USNS Kingsport, and Camp Roberts, California, and teletype transmissions to an aircraft on the San Francisco-Honolulu route.